Another Sewing Indie Month installment and today I’m very excited to share my interview with Morgan of Thread Theory Patterns. In the indie sewing world (and even in Big 4) stylish menswear designs are few and far between so when I found this Canadian company it really piqued my interest. Like many of you, menswear isn’t something I’ve had much experience with but Thread Theory with their cool, modern styling might become a gateway drug into a whole new sewing adventure. Do you sew for the men in your life? If so, have you tried any of Thread Theory’s patterns? I’m working on some Jedediah shorts right now! Thanks so much for doing this interview! Let’s begin with an easy question: what made you want to release a line of menswear sewing patterns? The idea for Thread Theory developed while on a road trip across Canada during which we had lots of time to daydream and brainstorm. We were discussing ways in which to make the things we love into careers and, of course for me, sewing was what I wished I could do all day! I enjoy sewing menswear because it pushes me to pay careful attention to detail and I enjoy the challenge of working creatively within people’s rigid expectations for menswear style. When I started to sew clothing for men it became quickly apparent that while there were existing menswear patterns, almost all of them would not result in the fit and style of garments that are prevalent in fashionable menswear clothing stores. I wanted to sew menswear that Matt and other men in my family would choose to wear as daily casual clothing. I wanted these garments to have a modern fit and the hard-wearing stitching and careful design details that men expect on their clothing. Since there was nothing like this available and Matt and I dreamed of becoming entrepreneurs, what better way to fill this void than provide the patterns ourselves? Many women sew for themselves or their kids but sewing for the men in our lives is often new territory. How does men’s sewing differ from women’s? What are some challenges sewists should look out for that you wouldn’t necessarily encounter when sewing clothes for ourselves? While tailoring seems very intimidating to many home sewers (me included! ), sewing casual menswear, such as the designs we have launched so far, really doesn’t differ very much from sewing other garments. If you can sew a dress for yourself or a t-shirt for your child, you can sew our patterns! Once you become more familiar with sewing for men, it is fun to play around with small details on the garment since these details, such as a contrast thread colour for topstitching or a little tag added to a trouser back pocket, make a big impact on the final garment. While the sewing skills needed are not all that different than sewing a dress or blouse, menswear is often perceived to be much more detail oriented. Styles do not change as radically or as often as they do in women’s fashion so wonky topstitching or a poor fit might not be as easily “covered up” by a crazy print or trendy silhouette. While this could be a little intimidating, it is also the most rewarding part for me! A little bit of care while sewing and also a little thought and creativity when it comes to adding tiny custom elements can produce something that really looks high end and original! Another advantage to menswear fashion being so stable is that once you find a pattern you enjoy sewing and have perfected the fit, you can create many versions of this garment over the years that remain stylish simply due to your fabric choice. If you are a person who loves fabric, menswear sewing can be really satisfying because the basic garments are perfect backdrops to highlight beautiful wools, Italian shirtings or soft bamboo knits. Which of your patterns would be the easiest one to start with if you’ve never before ventured into men’s sewing? We rate our patterns on a scale of 1-5 using little needles to represent the difficulty levels. Our Comox Trunks are “2 needles” and very simple and quick to sew. They are a great introduction to sewing knits. We just finished creating a sew-along for this pattern on our blog so if you are a little intimidated by knits, you can access all our pictures and tips for every sewing step (I even discuss how to set up your machine for knits…you don’t need a serger to sew these!). Our Strathcona Henley pattern is also a great project for beginners because it includes two variations – a classic Henley shirt with a button placket and a crew neck t-shirt. The button placket is a little fiddly but the crew neck is very easy to sew. Once you have gained confidence by sewing this variation, you can use the pattern again to try sewing the Henley! Historically men’s fashion hasn’t changed as much over the years so sometimes men’s sewing gets a bad rap of being “boring.” But what I like about it is that it gives us the opportunity to try new techniques and find unique ways of making the clothes more personalized than RTW. What are some of your favorite ways of making menswear look polished that we might not think about doing when we’re whipping up a plain ol’ sundress? I love doing these sorts of things with the JedediahPants. We included facings on the front pockets so you can pick a really loud and fun pocket lining fabric without fear that it will peek out and show when the pants are worn. You could even cut the pocket lining so that the right side of the fabric is visible from the inside of the pants – a great way to make the pants look really appealing on the hanger so they will be chosen over all those boring store bought pants again and again! We include instructions for applying bias binding to finish the side seams of the Jedediah pants. This is another fun way to add some colour. If you make the shorts variation with the rolled cuff, the binding is displayed on the cuff for a great stripe of unexpected colour. With the Newcastle Cardigan, I love playing around with stretch suiting colour and texture choices for the shoulder and back details. I like to keep the colour and weight of the pants that will most often be worn with the cardigan in mind. For instance, I made Matt a brown Newcastle Cardigan but used a contrast grey stretch suiting for the shoulders because I knew he would forget to avoid black and grey pants when wearing brown (:P)…now he looks put together and stylish no matter what colour pants he chooses to pair with his cardigan! One last idea (this is getting a little long but I have so many more I could add!) for an easy but really customized addition to any shirt or top sewing project (the Stratchona Henley, for instance) is a contrast patch pocket. A small pocket on the chest doesn’t need to be made out of a knit and so the colour and print choices are endless! A colourful wool pocket would give a simple grey Strathcona tee a great hipster vibe. A quilted pocket would be really trendy and stylish. It’s a great way to use up scraps and make something more fun and original than you would easily find in a store! I have lots more ideas for customizing menswear which I blogged about when we were first developing our patterns. So far you’ve got trouser, coat, cardigan, knit shirt and trunks patterns. What designs styles do you want to add in the future? Were happily working away on our next collection at the moment. It’s called the Alpine Collection and will feature garments that are perfectly suited to outdoor adventure – they will be hard wearing, include lots of variations to suit specific activities (think reinforced knees and hems, optional pockets for storing fishing and hunting equipment and linings that could be added for sweat-wicking or extra warmth). We’re working from the base layer outwards with this collection so our Comox Trunks were the first edition to this collection and we will end it with outerwear later this year. We’ll be releasing each design one at a time as they become ready (hopefully to suit the current season). We love receiving email requests for future patterns. If you have a garment you’d really like to sew but can’t find a pattern, send a note to info@threadtheory.ca. Haha! We have received a very enthusiastic response about the modern styling of these trunks and I attribute that to just how many underwear ads I perused :P.
Matt is usually our photographer but I snagged that job for this opportunity :P. I did the photo shoot with our underwear models with my sister and we spent a lot of time giggling! The models were varsity basketball players at my sister’s university and had never modelled before. They were so brave to stand out there on the mountain in the cold as people gawked at them as they walked by with their dogs. Thank you for interviewing us, Dixie! I’m thrilled to be featured on your blog as it has been an awesome resource for me and great reading. 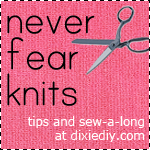 A note to anyone who is reading this and wants to try out our knit patterns but is a little nervous about sewing knits: Dixie’s series called “Never Fear Knits” will give you all the confidence you need – it sure helped me out when I was first familiarizing myself with knits!